located at 6600 Strawflower. The pools are scheduled to open Memorial Day weekend! The pools will be open to both residents and non-residents, but there are fees for their use. 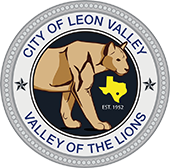 or go to Leon Valley City Hall and sign up for season passes starting on May 1, 2019. Monday through Thursday, and from 8:00 am to 5:00 pm on Fridays. and you will receive an arm band(s) for the season. The fee schedule for the 2019 season.